You will need to know who that caregiver is in the next few days, so please begin to have a conversation with your friends and family now. 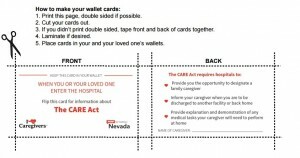 Beginning January 1, 2015, more than 500,000 Nevada family caregivers and their loved ones will get some much-needed help. 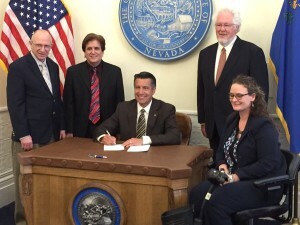 The Nevada Legislature passed a new law, known as the Nevada CARE Act, during its 2015 session. The new law strengthens communication between hospitals and family caregivers, ensuring a designated caregiver is notified when a loved one is discharged or transferred, and receives instruction on any after-care required at home – such as managing prescriptions or dressing wounds. 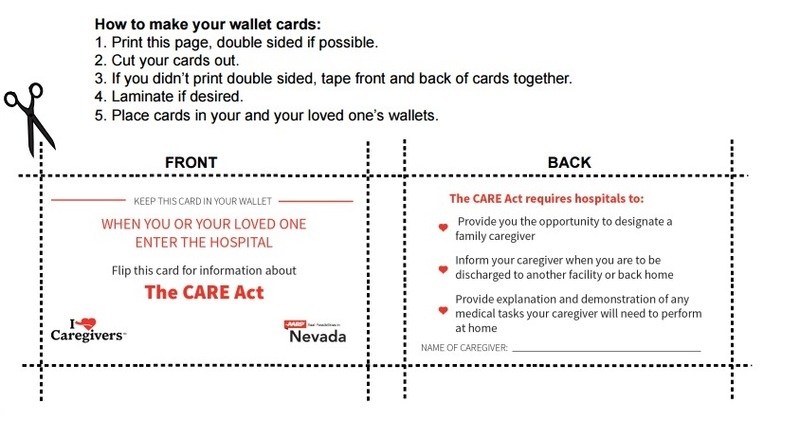 The law was designed to help caregivers stay informed when a family member or friend is in the hospital, and be better prepared to take care of their loved one at home following the hospital stay. The result should be fewer hospital re-admissions and greater opportunity for older parents, spouses and other loved ones to continue living independently at home. Provide the caregiver an explanation and demonstration of any medical tasks which will need to be performed at home, such as wound care or medication management. Whether you currently serve as a caregiver for a family member or friend, or just want to be better prepared in the event of your own hospital stay, you should be aware of your rights under the CARE Act. Have a family discussion about who you would designate as your caregiver, and carry that person’s name and contact information with you. Keep in mind that your caregiver will not necessarily be the same person as your legal next of kin, especially if your family members don’t live in your community. The Caregiver’s Journal recognizes that uncomfortable conversations about potential need for assistance, medical issues and other life events can be difficult to bring up. However, being proactive and knowledgeable is always a better option than trying to play “catch up” when life happens. To help your caregiver keep track of the information they will need to care for you, please consider purchasing a copy of The Caregivers Journal at by clicking here. For more resources for caregivers, visit our website at www.the-caregivers-journal.com. 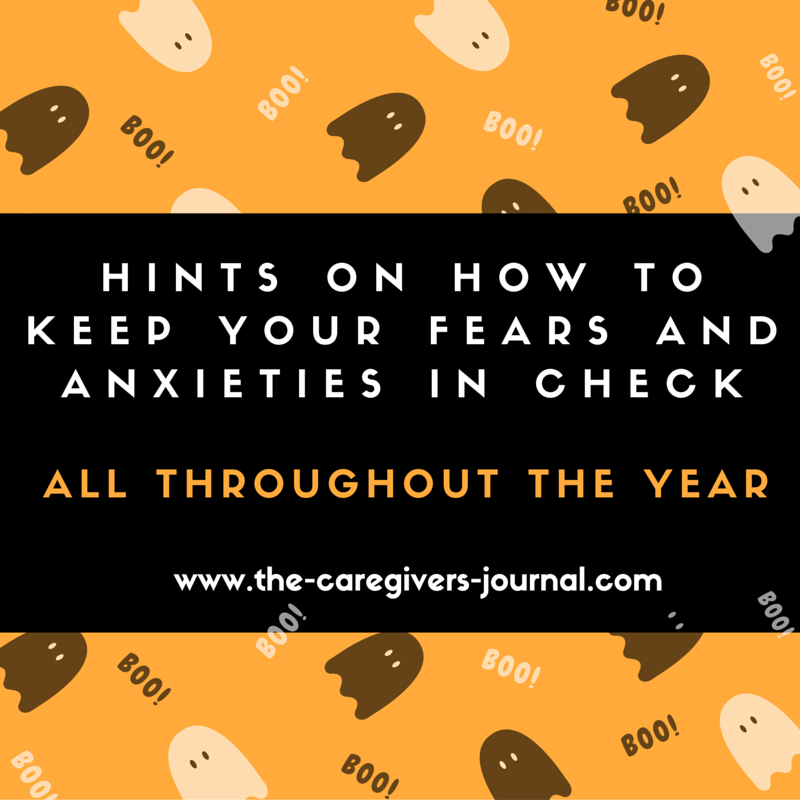 Halloween is a time when even as adults we might be fearful or anxious. Between scary decorations, wanting our kids to be safe and maybe knocks on the door at 11pm by towering teenagers wanting candy…well…it can overwhelm. But it is temporary. 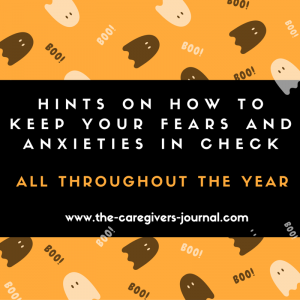 Caregivers may face fear and anxiety all throughout the year. They are normal responses to the many stresses of caregiving and associated issues such as health, financial and other worries. Caregiving often comes with a loss of control. Many caregivers feel uncertain about the future and worry about the suffering, pain of the person for whom they care. Often times it comes as a normal part of the grieving process. Fears about loss of independence, changes in relationships, and bearing the burden of caregiving duties as well as worrying that they will be a burden to others if they reach out to others to share the caregiving duties can be too much to deal with all at once. Many caregivers feel stressed trying to balance work, child care, self-care, and other tasks, along with this extra work. All of this is on top of having to worry about and take care of the person who also needs them. From the immediate need in the month of October, to managing these issues year round, we’ve provided some tools and techniques to help everyone in the caregiving relationship. For seniors who live alone, work with your caregiver to put together a Halloween plan. Many aspects of this plan can also be applied on a daily basis to reduce fears and anxiety. You can still have fun with the holiday and be safety smart. 1) Ask around your neighborhood and social network to see what is going on Halloween night. Then make a decision whether to stay in, or out, and then let your caregiver (s) know your whereabouts. 3) Halloween night out – Be with other people at a scheduled event either at a neighbor’s house for a casual cup of tea or hot cider, visit your local senior center, or the house of a family member. Whether you are a caregiver or the person receiving care, mindfully practicing relaxation can decreases the effects of stress on your mind and body, ranging from everyday stress to that related to health problems such as cancer and pain. Numerous responsibilities and tasks, or the demands of an illness or just every day “living” all may contribute to you missing out on the health benefits that relaxation can provide. Breathe Deeply – Deep breathing counters the effects of stress by slowing the heart rate and lowering blood pressure. Take a break and focus on your breathing. Sit up straight, eyes closed, with a hand on your abdomen. Slowly inhale through your nose. Be aware of how the breath starts in your abdomen and works its way to the top of your head. As you exhale through your mouth, follow the breath’s path in the opposite direction. Be Present – Slow down. Be silent. Focus on one thing versus multitasking. What does the air feel like on your face when you’re walking? How do your feet when they hit the ground? When you take a bite of food, what is the texture and the taste? This technique eases tension and quiets the mind. Tune In to Your Body – Lie on your back, or sit with your feet on the floor. Mentally scan your body from head to toe. What parts are tense? Hurting? Fatigued? Be Grateful – “A thankful heart is a happy heart.” Being grateful for your blessings has the power to cancel out negative thoughts and worries. Purposefully document your gratitude, either through a social media 100-day gratitude challenge, or keep a gratitude journal on hand throughout the day so that you can remember all the things that are good in your life. For more relaxation techniques, visit Web MD today or visit our Pinterest page . Use a cane or walker for added stability. Wear rubber-soled shoes for traction. In winter, carry salt or kitty litter to sprinkle on slippery sidewalks. This video below, “Alone,” is a 60-second television public service announcement. It uses a dose of humor contrasted with the stark reality of falling to educate viewers on the importance of making their homes fall-safe. Please share this video to help prevent injury and death associated with falls. For more info on fall prevention and visit the National Institute on Health (NIH) website or visit this series on fall related publications. July is a month when the U.S. celebrates freedom. Caregiving is often associated with restrictions on an individual’s independence. This month The Caregiver’s Journal is taking fresh approach. While we realize that caregiving has its limitations, caregivers also have a lot of freedom in how they deal with their individual circumstance. You too can discover freedoms in your caregiving role. No really…we aren’t kidding. Here are a few hints to get started. Maintain their liberty without declaring independence from the ones they love. Caregiving takes the focus off our typical self-reliance and demonstrates our mutual needs as human beings and as a community. Educate themselves with accurate information by engaging with credible resources that help improve the health and well-being of their loved ones and everyone involved in the care. Graciously accept help when people offer it, while freely communicating the specific help needed and when. Experience grief as a part of the process. Caregivers help survivors deal with feelings of guilt, helplessness, anger, fear, and grief and move through those emotions while accepting their necessity as part of healing. Embrace the happiness bestowed through caregiving. Although the virtue of caregiving often seems too ordinary and undervalued, it is truly extraordinary in this world where giving and receiving of care is often eschewed. How has caregiving changed your definition of independence? 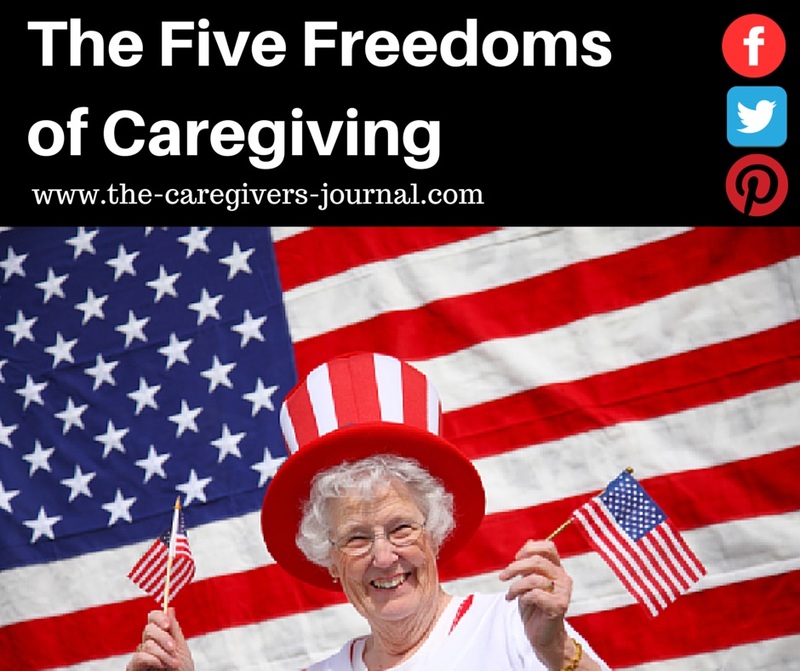 E-mail us at laura@the-caregivers-journal.com or tweet to @jmariegibson if you can contribute more freedoms that you have experienced in your caregiving journey. 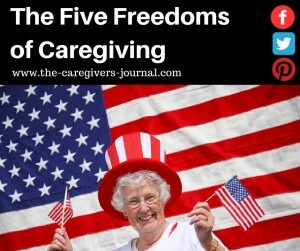 We will publish your responses in next month’s article, so check it out on our website www.the-caregivers-journal.com .